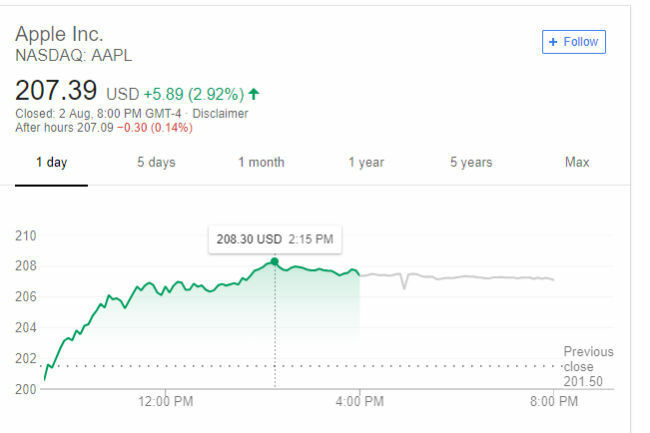 Apple's share price reached $207.05 when it touched the trillion dollar cap and closed at an all time high at $207.39. In a memo, CEO Tim Cook thanked the employees for their dedication and hard work, and also extended gratitude to Apple customers. Had he been alive, Steve would have been very happy to see the “Jobs” done. Apple has become the first public company to reach the magic number of $1 trillion. Shows you the poser of technology, doesn't it? On Thursday night the tech firm’s share price reached $207.05 when its valuation became a trillion dollar. The shares continued to soar to $208.30 and closed at an all time high at $207.39. Apple's stocks have been on an upward spiral since Tuesday when it announced its best-ever June quarter results, registering a 17 percent year-on-year increase. The iPhone-maker announced a quarterly revenue of $53.3 billion in its third fiscal quarter. It said that the international sales accounted for 60 percent of the quarter’s revenue. “We’re thrilled to report Apple’s best June quarter ever, and our fourth consecutive quarter of double-digit revenue growth. Our Q3 results were driven by continued strong sales of iPhone, Services and Wearables, and we are very excited about the products and services in our pipeline,” Apple’s CEO Tim Cook said in a statement. “Our strong business performance drove revenue growth in each of our geographic segments, net income of $11.5 billion, and operating cash flow of $14.5 billion. 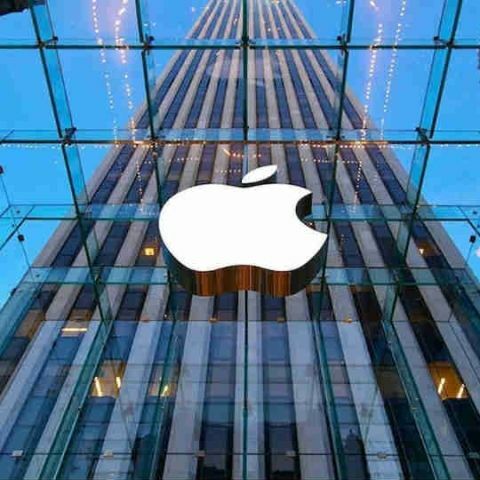 We returned almost $25 billion to investors through our capital return program during the quarter, including $20 billion in share repurchases,” Apple CFO Luca Maestri added. Apple has beaten its direct rival Amazon, which was seen as a major hiccup in the company’s pursuit of becoming the first public company to hit the $1 trillion valuation. Apple CEO Tim Cook has thanked employees for achieving the milestone. “Today Apple passed a significant milestone. At our closing share price of $207.39, the stock market now values Apple at more than $1 trillion. While we have much to be proud of in this achievement, it’s not the most important measure of our success. Financial returns are simply the result of Apple’s innovation, putting our products and customers first, and always staying true to our values,” the executive said. “It’s you, our team, that makes Apple great and our success is due to your hard work, dedication, and passion. I am deeply humbled by what you do, and it’s the privilege of a lifetime to work alongside you. I want to thank you from the bottom of my heart for all the late hours and extra trips, all the times you refuse to settle for anything less than excellence in our work together. Let’s take this moment to thank our customers, our suppliers and business partners, the Apple developer community, our coworkers, and all those who came before us at this remarkable company,” Cook added. He showered words of praise on the co-founder saying, “Steve founded Apple on the belief that the power of human creativity can solve even the biggest challenges – and that the people who are crazy enough to think that they can change the world are the ones who do. In today’s world, our mission is more important than ever. Our products not only create moments of surprise and delight, they empower people all around the globe to enrich their lives and the lives of others. Just as Steve always did in moments like this, we should all look forward to Apple’s bright future and the great work we’ll do together, he added. According to BBC, since the iPhone first went on sale in 2007, Apple shares have soared by 1,100 percent. It has registered a 50,000 percent rise since it was first listed in 1980. It is an astonishing feat achieved by the company, which in 1997 was under threat of bankruptcy. Apple was co-founded by Steve Jobs and the Steve Wozniak (aka The other Steve) in 1976 in a garage, and the company saw a fair share of ups and downs. Apple initially made and sold Mac computers. However, just in nine years time in 1985, Jobs was forced to leave the company which laid the foundation of a slow downfall. The company was struggling in 1997 and a familiar face in the shape of Jobs returned to pull the company out from the gallows. The visionary entrepreneur launched innovation-laden gadgets after gadgets, pioneering the tech industry. From the launch of the first iPod in 2001 to the iPhone in 2007, the company showed that it plans to rule. It was under Jobs in 2010 that the company launched the first iPad. He died in 2011 as company’s CEO and left everything up to Tim Cook to take the company forward. In these 10 years, Jobs took the company’s $6 billion market value to $624 billion cap. 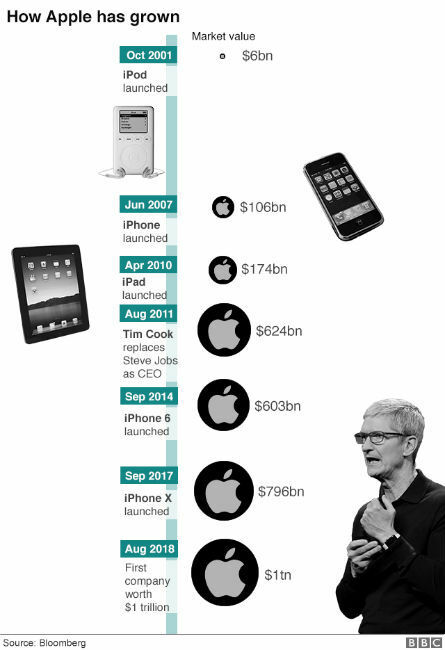 When Cook took over, Apple was seen as the company of the riches, at least in India. Tim Cook changed the strategy and showed it was not all about the money but a relationship with a customer. He made the iPhone more “achievable” keeping the “Premium” tag intact at the same time. Last year its sales hit $229bn, with profits of $48.4bn, making it the most profitable listed US company. Apple has become a company to be looked up to. Everyone wanted to be Apple, but no one could -- can anyone ever be? is iberry is trusted company?